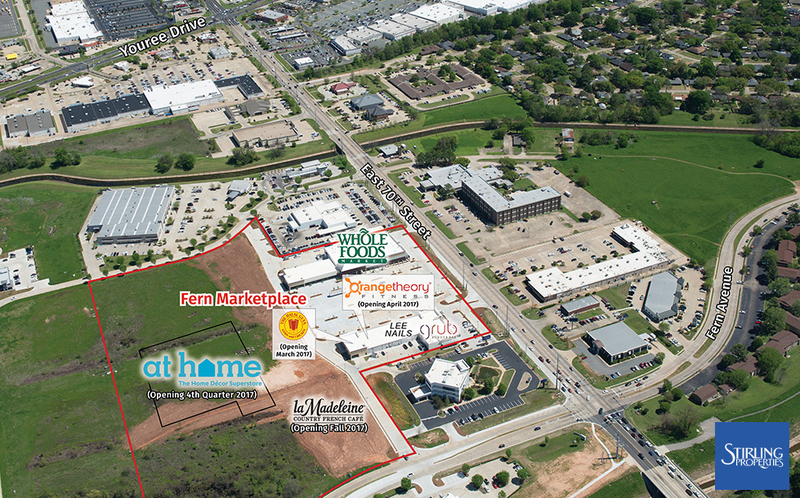 Stirling Properties commercial real estate company is pleased to announce new tenants at Fern Marketplace in Shreveport, Louisiana. At Home, the home décor superstore, has purchased 8.16 acres of land to build a 108,931-square-foot retail store. Construction is scheduled to commence by the end of the month with plans to open in the 4th quarter of 2017. La Madeleine Country French Café has purchased a 1.18-acre tract of land to develop a 7,500-square-foot free-standing restaurant location. Plans are to open in the fall of 2017. Stirling Properties’ Senior Retail Leasing & Development Executive, Rhonda Sharkawy, was involved in both transactions on behalf of the Seller. Previously announced tenant, The Halal Guys, is still on track to open in late March of this year, and Orangetheory Fitness plans to open in early April. Fern Marketplace is a 14-acre retail development anchored by Whole Foods Market, consisting of roughly 200,000 square feet. The shopping center is located at the northeast corner of East 70th Street and Fern Avenue, near the intersection of Youree Drive. Tenants include At Home (opening 4Q 2017), Grub Burger, La Madeleine (opening Fall 2017), Lee Nails, Orangetheory Fitness (opening April 2017), The Halal Guys (opening March 2017), and Whole Foods Market. Most of these retailers committed to Fern Marketplace are either first-time locations within Shreveport or Louisiana, or both. At completion, Fern Marketplace is expected to be a premier regional shopping and entertainment destination, as well as a vital economic contributor to the area. Stirling Properties handles management and leasing for the Center. For more information, please visit stirlingprop.com. For leasing or sales information, contact Rhonda Sharkawy at (504) 620-8145 or rsharkawy@stirlingprop.com. For asset management information, contact Donna Taylor at (985) 898-2022 or dtaylor@stirlingprop.com.